Chingle Hall lies just north of Preston, in the small village of Goosnargh, it is one of Britain's oldest and most haunted buildings (it's the oldest inhabited brick building). The house formerly known as Singleton hall was constructed in 1260 by the knight Adam de Singleton. The Hall remained in the de Singleton's family late into the 16th Century. In 1585 the Wall Family who were related to the Singletons, moved into the Hall. John Wall was born in the Hall in 1620, he studied at Worcester University. 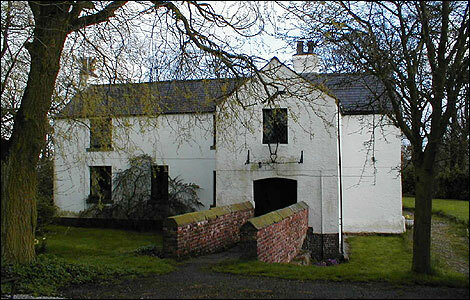 In 1641 he became a priest, during the time of the Catholic Reformation it was illegal to practice mass in Britain, Chingle Hall was used as a place of worship by Catholics and had many priest holes and secret compartments were made for the people taking part the mass to hide if the Hall was raided by the kings soldiers. At this time Father John Wall was most active, conducting secret mass on a regular basis. In 1678 he was apprehended at Rushock Court near Bromsgrove, as he was tendering the Oath of Supremacy. He was taken to Worcester jail, where he was offered his life if he would foresake his religion, but he declined. Brought back to Worcester, he was drawn and quartered at Redhill on the 22nd of August 1679. His quartered body was given to his friends, and was buried in St. Oswald's churchyard. Mr. Levison, however, secured the martyr's head, and it was treasured by the friars at Worcester until the dissolution of that house during the French Revolution. It is rumored to be buried the Hall's grounds or hidden in the building itself. The Franciscan nuns at Taunton claim to possess a tooth and a bone of the martyr. He was Canonized by Pope Paul VI in 1970. In 1764 the house was passed to the Farrington family during these times Chingle hall was a hub for zealous religious activity. Great effort was made to keep alive the Roman catholic traditions, cavities were built into walls and tunnels were dug to some of the surrounding buildings as a method of escape. Once inside the Great Hall, you see the wooden beams going across the ceiling. Some of these beams have strange symbols on them. No one really knew what these symbols were, until some scientists took samples of the wood. They found that the wood was much older than Chingle Hall, and had a lot of salt in them. The wood had actually come from an old Viking longboat. During the 1950s one of the beams spontaneously caught fire, and, just as quickly as it had started, it inexplicably extinguished itself. The smell of wood burning lingers in many of the rooms. The Different stories of paranormal activity at this location are huge, as is the number of different spirits that reside here. The most popular ghost at the residence however has to be that of Eleanor Singleton. The smell of lavender coming from her old bedroom has to be the most popular experience, but apparitions have also been witnessed. The amount of activity at the hall in massive. Reports include almost every type of haunting, such as apparitions, physical contact, sudden unexplained nausea, feeling of being watched and of unexplainable presence's, smells, footsteps, poltergeist activity and electronic voice phenomena. It cant be denied that the claim to the hall being the most haunted house in England isn't made without good reason.